Speaking of which, thoughts turned naturally to that opus, so instead of my discard bins, I went to the main racks… and it was gone! Now, I had decided that I needed less DOA a while back. I have tried unsuccessfully to sell/trade my cheap, nasty generic Us Epic sleeved copies to no avail, but I would have been sick in the head to ever thing of ditching “Brand New Lover” though that’s the only one NOT in my Record Cell right now; suggesting that I was in fact, sick in the head to ever think of getting rid of one of the best mixes ever! Unless this record is hiding, looks like I’ll have to buy the next copy I see. 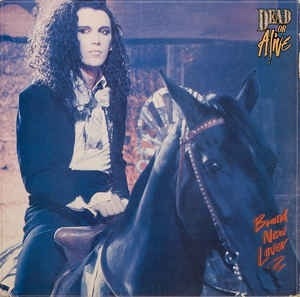 This entry was posted in Records I Used To Own and tagged 12" remixes, 1986, Dead Or Alive, Pete Burns. Bookmark the permalink. Almost seems a shame the disc with the BNL mixes on hasn’t been amongst the 12 discs that have been repressed from the box set otherwise you could have had them for (ahem) free Monk! The Dust Monkey Love Bubble Mix is available on Amazon as a mp3 for $0.99. If my memory is right Isn’t that the one that you said that you liked the most from that 12”? I know you’re adverse to file sharing otherwise I would direct you toward a certain blog that I am sure you’re already familiar with. I agree, by the way, on your reappraisal of the Lover Come Back to me single, that mix has the right alchemy of Hi-NRG, length and lack of affectations to make it a textbook example on how to make a mix. Tim – Thanks got the tip. A good last resort but I should have the vinyl. After you told me about Amazon, I looked on iTunes and saw the same cut on a comp of CBS dance mixes in [preferable] AAC format at the same price. Glad to be of help. I think you’re probably seeing the same comp on itunes that I saw on Amazon (sorry I don’t use itunes). I’m disgruntled that the (properly pitched) 7″ single edit of “Brand New Lover” still isn’t available – both the 2010 singles collection and the new box set (along with “VH1 The Big 80s”) sourced that track from the same flawed master. And “Lover Come Back To Me” is arguably DOA’s best single – the 7″ bonus mix on the 12″ single is excellent, and a track I’ve always wanted on CD, but I can’t justify buying the box set for it. If Edsel were wise, they’d issue at least the first three albums separately. Shelf – Funny you should mention the “Up Ducky” mix on RetroActive7. Not surprisingly, I was just listening to that CD this afternoon. It would be crazy of Epic not to issue the first three DOA albums; probably in what we used to consider lush, 2xCD versions packed with most of what we need. Or make the entire SDL available as a track-by-track download as Marc Almond has with his set over at Amazon. I am entirely uninterested (and unwilling) to buy something that I have already bought before. I’m never going to buy the whole box but I will buy parts of it and a sale is a sale. The 2 CD editions of each of those albums in the box set would be perfect standalone items. And I was just looking at the track listings for the box set replacement discs – looks like Edsel corrected the pitch problems that plagued both the faulty discs and the 2010 compilation. Nice that all those problems were fixed, but 12 defective discs in a 19-disc box set? Was quality control on long-term leave? Despite less than optimal sound quality (the dreaded compression problem), the ‘RetroActive’ series was pretty decent. Some of the tracks on those discs are still unavailable elsewhere on CD. On the other hand, the Blank & Jones ‘So80s’ series suffers from inconsistent track selection – it’s all over the place (which I imagine many people probably appreciate). The Alphaville collection and a couple of the other single artist discs are nice, though. My big decision for the Xmas season is whether to buy the Marc Almond set or the Visage set. In both cases its about being ridiculously completist as well as falling hard for the design of both sets. Echorich – Buy both. Why limit yourself? I would go for the Marc Almond one in a heart beat. The only problem with the digital download version is the lack of the book, which is the only sort of frou frou in these box sets that i think is worth it (keep the t shifts, pins, posters, postcards, et al). These things go out of print, don’t they? The Visage appears to be fairly complete as far as digital downloads go and if it was me I would not reinforce the practice of printing to CDR (!) as any kind of norm by giving them money for that. Home taping is killing music, indeedy. Same as it ever was….same as it ever was!